This is super easy, filling and surprisingly refreshing salad that takes only minutes to make once you have the beans ready. I prepare my beans ahead of time and store batches of them in the freezer. I pull them out of the freezer when I’m ready to make this salad. 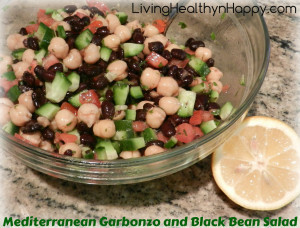 If you prefer, you can purchase cans of organic garbanzo and black beans (remember to rinse them well before using). This recipe is Gluten Free, Grain Free, Dairy and Egg Free, and Vegetarian and Vegan. 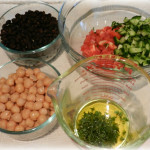 Put Cucumber, Tomato, both Beans and Mint in medium bowl. Pour in Olive Oil and AC Vinegar. Mix together. Add salt, pepper as you prefer. If you like a bit more tang, you can optionally add 1 or 2 tsp. of Lemon Juice. Optional – Feta cheese is best sprinkled on top directly before serving (leave off for dairy-free version). 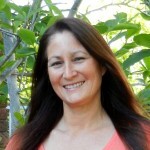 Judy is a blogger at Living Healthy ‘n’ Happy where she loves to share information on Real Foods, Wellness, Natural Health and her Daughters Inspirational Healing Journey. She also created a Recipe Sharing Section for all to use. I hope that you find some wonderful recipes, tell friends about it. And, leave a few of your healthy recipes too to share with others who are looking for Nutrient Dense Recipes made with Real Food. This recipe originally appeared here at Living Healthy ‘n’ Happy.